The marriage of Louis and Frances Payne (above) ended in bloodshed when Louis found his wife in bed with another man. During his murder trial in 1928, Payne cited the so-called “unwritten law”as a defense. On August 31, 1928, a husband returned home unexpectedly to find his wife in bed with a male houseguest. He shot them both, killing the woman and critically injuring the lodger. Then the story gets weird. The shooter, Louis Marvin Payne, a Georgia mill worker, had moved his family to Milwaukee a month before the shooting. 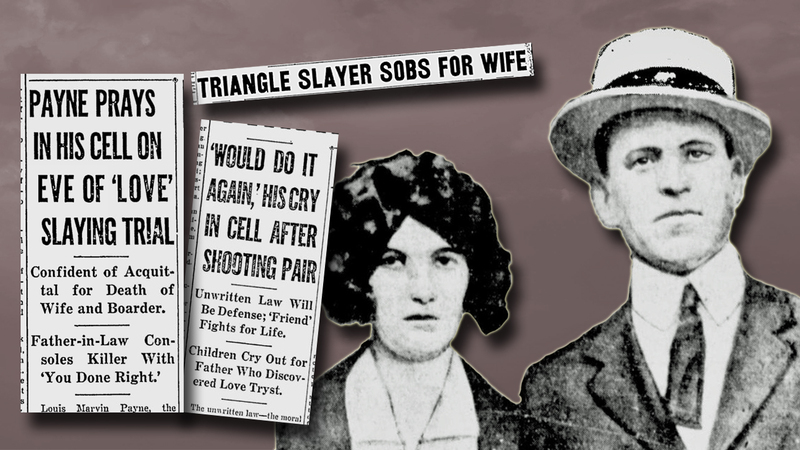 Payne proclaimed his innocence under “the unwritten law.” Meaning, he felt his actions justified because the victims violated the sanctity of his marriage. In this, Payne had an unlikely ally. The father of the slain woman traveled from Athens, Georgia, to appeal for her killer’s freedom. The father, Shuff Hix Parker, told reporters the fatal shooting of his daughter Frances was within any husband’s right, given the circumstances. These southerners felt that about wrapped it up. Authorities disagreed and charged Payne with first-degree murder. A panel of 12 men (Payne had instructed his attorney to dismiss all women during the jury selection process) would decide if the unwritten law trumped Wisconsin’s statues. Louis Marvin Payne grew up poor and illiterate. He never attended school. His father died when Payne was 9 years old. A year later, the boy went to work in the cotton mills of Georgia. After serving in the U.S. Army during World War I, Payne married Frances. The couple had three children. It was a troubled marriage. At one point Frances abandoned her family to live with another man. She returned, only to leave a second time. Feeling as though his life had hit rock bottom, Payne turned to his faith. “The whole world looked like it was against me and I got into this religious work to do good for others,” Payne testified at his trial. The reunited family moved to Milwaukee. Payne found work soliciting funds for an obscure charitable organization called the Samaritan Army and struggled to support his family on a percentage of the donations he collected. Payne testified he made every effort to please his wife. Indeed, it came out during the trial that the three children slept on the floor due to lack of furniture but Mrs. Payne’s closet contained no less than 40 dresses. The basement flat on Hanover Street (today′s South Third Street) was a crowded dwelling. In addition to the couple and their three young boys, the occupants included Mrs. Payne’s brother. They also took in a family friend from Georgia, Fate Palfrey, as a boarder along with Palfrey’s nephew. Payne left home that August day in 1928, intending to travel to Pewaukee with a fellow fundraiser. However, he discovered his coworker was ill and the day′s plans fell through. Payne returned home to find his children playing outside and his wife in bed with Fate Palfrey. Payne told the court he found Palfrey and his wife “hugged up” and that she was trying to get loose from the boarder. “I thought he had forced her in there and that he would assault her and kill us both,” said Payne. Not true, Fate Palfrey said when he took the stand. He said Mrs. Payne entered his room that morning to tell him breakfast was ready. She sat on the edge of his bed to chat. She pulled the blanket over herself as she talked of plans to scrub two rooms and go the store. “I reckon I didn’t have no right to tell her to get out of the bed – it was her house,” Palfrey told the court. Suddenly the couple became aware that Payne was in the room with them. He gazed wordlessly at the two and then vanished. They heard Payne rummaging though his dresser and then heard the unmistakable sound of a pistol being cocked. Leaping from the bed they rushed for the doorway. A shot fired and Frances Payne fell with a .32 caliber bullet in her chest. The coroner′s report noted she was fully clothed. She was even wearing shoes. While the two men battled for control of the pistol through the rooms of the flat and out into the backyard, Frances Payne, who owned 40 dresses, bled to death on the floor of the basement flat. She was 26 years old. Leo Matt was working in a factory across the street. When he saw the struggle in front of the house, Matt hurried outside to break up the fight. As he pulled the men apart, Payne fired a bullet into Palfrey’s abdomen and then swung the gun in Matt′s direction. Matt dived behind a parked car. At that moment, a passerby, university student John Kruft, slipped up behind Payne and pinned his arms. Matt, picking himself off the ground, took the revolver away from Payne. According to court testimony, Payne, spewing curses, “addressed a remark at Kruft which was not complimentary.” In response, Kruft punched Payne in the jaw, ending the fight. The morning of the shooting, the mother sent her children – Louis age 8, Preston, 6, and Curtis, 4 – outside to play without their breakfasts. She “run us three kids out all the time,” Louis added. In shaping Payne’s “unwritten law” defense, his attorney, William Rubin, was repeating an argument he had made in defending an equally sensational Milwaukee murder six years before. In the winter of 1922, Joseph Branske, a 32-year-old shoe repairman, shot and killed August Schreiber while the latter was at work in a ditch on Oklahoma Avenue. The shooting took place in broad daylight and was witnessed by numerous people. Branske, the father of three small children, entered a plea of temporary insanity caused by the wrecking of his home. Branske told police he killed Schreiber because the man was carrying on an affair with Branske′s wife. He had even complained to the district attorney, but no action was taken since he was unable to prove an offense had been committed. After several months, Branske tracked down Schreiber and shot him repeatedly. The unwritten law defense was used at his murder trial, a move that attracted wide notoriety at the time. Branske was convicted of lessor offense, served one year, and returned home. Perhaps there was unstated sympathy for these self-proclaimed upholders of the unwritten law, for Louis Marvin Payne also served an unusually short sentence. He was paroled at Christmas 1933, having served just five years of his 14-year sentence. However, Payne didn′t remain a free man for long. He met a woman, Mrs. Clara Helfrick, who was in the midst of divorcing her husband. Enraged when she rejected his advances, Payne stabbed Mrs. Helfrick and then turned the knife on himself. Both recovered from their injuries and Payne returned to Waupun State Penitentiary to serve the remainder of his sentence. The unwritten law defense is a thing of the past. In 1929, the state Supreme Court ruled it has no legal standing in Wisconsin. The ruling was handed down as part of a decision upholding Payne′s conviction for slaying his wife. This twisted thought is alive today under Sharia law that allows stoning of an unfaithful wife even if there is no proof of an offense. Let’s hope that isn’t the next wave of political correctness in our deteriorating society.